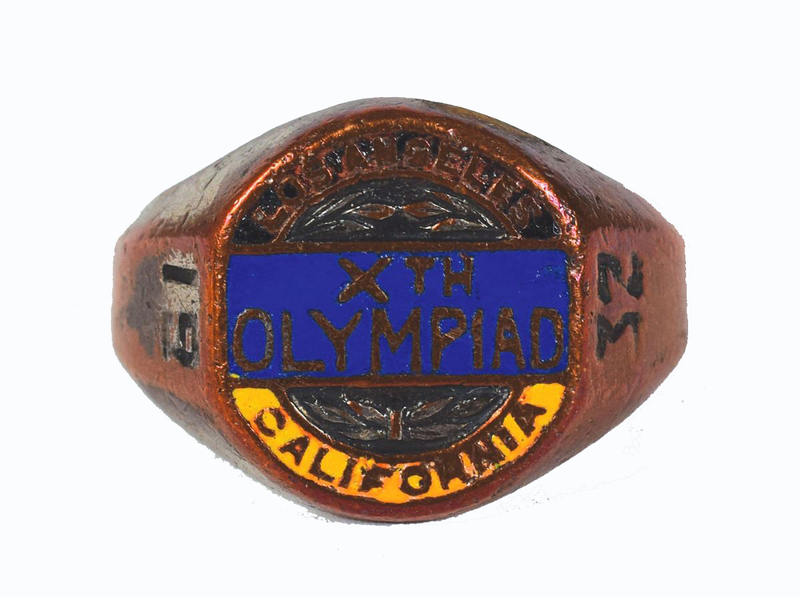 Buster Crabbe's personally-owned and -worn commemorative ring from the 1932 Los Angeles Summer Olympics, made by J. C. Fergusson's of Los Angeles, inside diameter of approximately .75?, with blue and yellow enamel design and text reading "Xth Olympiad, Los Angeles, California," and the sides engraved "19" and "32." 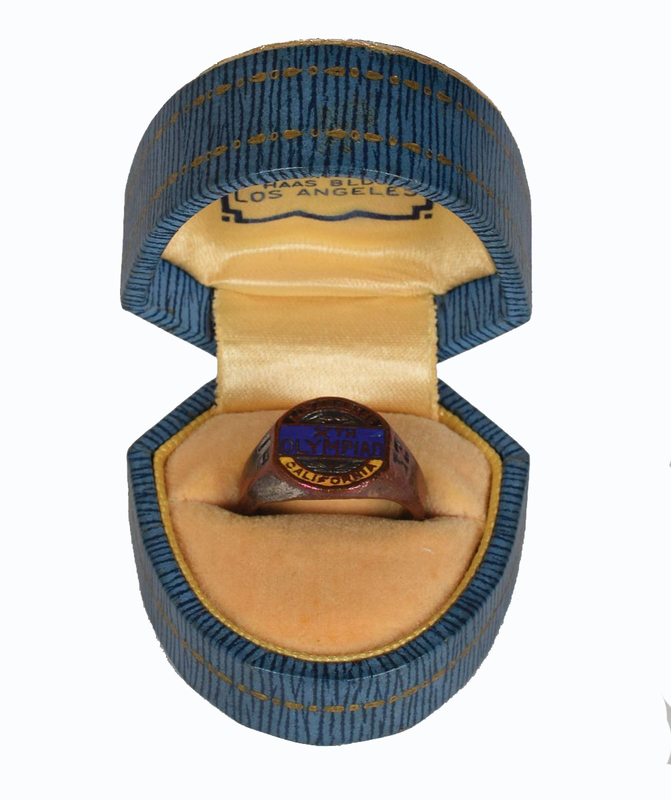 Includes the original blue J. C. Fergusson's presentation box. In fine condition. Accompanied by a Bonhams Auction tag. 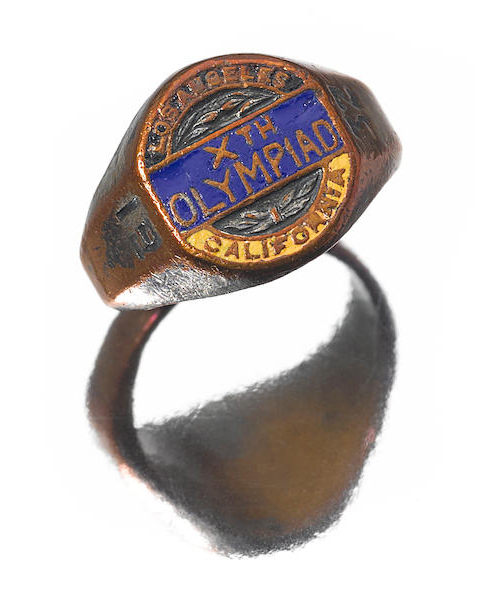 Crabbe won the gold medal in the 400-meter freestyle at the 1932 Summer Olympics. 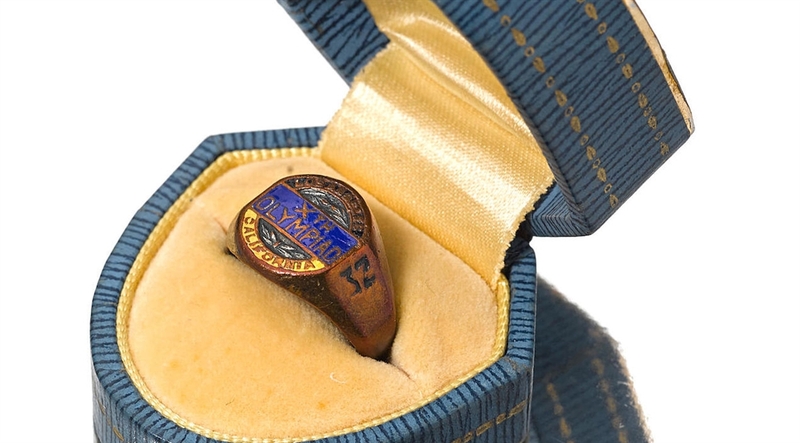 Four years prior, at the 1928 Summer Olympics in Amsterdam, he won the bronze medal for the 1,500-meter freestyle. From the estate of Buster Crabbe.Crabbe went on to star in many films and TV series, most notably portraying Flash Gordon and Buck Rogers. At the 1932 Olympics in Los Angeles, Crabbe faced world record holder Jean Taris of France and Olympic record holder Takashi Yokoyama of Japan in the 400-metre freestyle finals. Taris led most of the race, but Crabbe pulled even with 25 m to go and reached the wall one-tenth of a second ahead of Taris to set an Olympic record (4 min 48.4 sec) and win the gold medal. Hollywood movie producers, aware of the acting success enjoyed by Johnny Weissmuller after his Olympic swimming gold, signed Crabbe to an acting contract. He starred in more than 170 movies, including the title roles in the Flash Gordon and Buck Rogers serials. He also appeared on television, authored fitness books, and owned a successful swimming pool company. Crabbe set 16 world records and was named to the International Swimming Hall of Fame.